Overview Teamed with beautiful British agent Freya Carlson (Sharon Tate), Matt Helm (Dean Martin) is assigned to retrieve one billion dollars in gold, stolen by international crime czar Count Massimo Contini (Nigel Green). Determined to keep his ill-gotten gain, the Count orders two gorgeous assassins (Elke Sommer and Nancy Kwan) to dispatch Helm once and for all. My thoughts The sixties was the decade when the Bond spoofs bloomed. The Matt Helm series (4 movies) was neither the best nor the worst. I never quite understood where the producers got the idea that Dean Martin would make a good secret agent, even in a spoof. But it didn't turn out quite as badly as one might have feared. The films range from silly to imbecile, with The Ambushers being the worst of the lot. So at least The Wrecking Crew, the last of the 4, was a step up. On the plus side there is the ladies. Elke Sommer, Nancy Kwan and Tina Louise are just fine, but it is Sharon Tate who steals the show. Sadly this was her next to last movie before being so brutally murdered by "The Manson Family" in 1969. Without her this would have been a weak 2.5 stars, at best. The film is full of silly impossibilities. The portable helicopter - an idea clearly stolen from Bond - couldn't possibly fit in a car trunk. And the mountain road that ends at a cable car station in the fell like mountains. In Denmark, where the highest mountain is 170 meters! Well, you really have to be in a forgiving mode to enjoy this. But if you are, then it is passable. Thanks for all the comments about Ray Harryhausen! I actually own The 7th Voyage of Sinbad as well, forgot about it yesterday. I think I'll wait and see if Tne Beast from 20,000 Fathoms (previously seen) and Earth vs Flying Saucers come to Blu-ray. There is a 4-movie collection available now, but not only is it relatively expensive right now, it also includes The 7th Voyage of Sinbad which I already own. Well, maybe I'd get this if price drops real low. I think I'll wait and see if (...) Earth vs Flying Saucers come to Blu-ray. Well, it's in the set I mentioned... It's currently over $50, but has been as low as $30 before. Since I already own one of them I would really want to get it cheap, since I am basically buying three movies and a coaster. Overview The station adopts a stray dog, which they name Boot. The firemen rescue a boy from a hole; he turns out to be an abused child. Roy and Johnny rescue another boy whose head is stuck in a basement window. Dr. Early extracts a child's arm from a steering wheel. At a brush fire, Boot helps locate an injured hiker, then leaves with a hook and ladder truck. My thoughts Well, I hadn't planned on reviewing TV episodes. It's been some time since I watched this set, but I suddenly realized that this episode contained John Travolta's very first acting stint (on TV or film, that is). It's just a bit part and I don't think I recognised him the first time I saw this episode. It's not a very exciting episode, actually one of the weaker in the season, in my opinion. But it was fun to see the 18 year old Travolta. Over all I really liked this series, and I've got all seasons on DVD. There were many quite exciting episodes. This wasn't one of them. I'd give the series as a whole 4 stars out of 5, but this episode rates only 2. You are right. I simply love the humor and simplicity of Dean Martin and Jerry Lewis. Jerry Lewis served to keep Dean Martin from trying to 'be a star' and Dean Martin relieved what can be too much Jerry. What a powerhouse team, like Abbott and Costello, Laurel and Hardy etc. Overview His crime: nonconformity. His sentence: the chain gang. Paul Newman plays one of his best-loved roles as Cool Hand Luke, the loner who won't – or can't – bend to the arbitrary rules of his captivity. A cast of fine character actors, including George Kennedy in his Oscar®-winning** role of Dragline and the indelible Jo Van Fleet as Luke's mother, give Newman solid support. And Strother Martin is the Captain who taunts Luke with the now-legendary line, "What we've got here is...failure to communicate." No failure here. 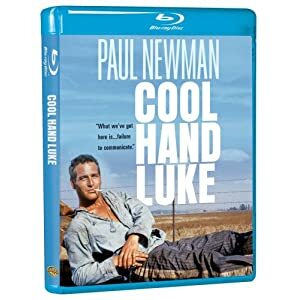 With rich humour and vibrant storytelling power, Cool Hand Luke succeeds resoundingly. My thoughts This is an excellent film. It has a great script. It has lots of excellent actors, many of whom has gone on to become famous later. So why did this film leave me indifferent? I really don't know. Maybe it was the downbeat ending. But I have seen many film noir with downbeat endings and liked them, so that doesn't make any sense. Maybe it was because I couldn't relate to the main character? Maybe it was just that I was in the wrong mode? I just don't know. Maybe the famous quote "What we have here is failure to communicate" applies to me? This should really be a 4 star film, but for me it was just a weak 3 stars. But don't let that put you off. By all accounts, this is an excellent film. Maybe the famous quote "What we have here is failure to communicate" applies to me? Overview This costume series portrays aspects of life in Pompeii, a coastal luxury resort near Naples catering for the very rich of imperial Rome, mainly before but culminating in the eruption of the Vesuvian volcano, which wipes it from the face of the earth. The main characters include Diomed, a common upstart merchant whose self-made riches from trade allow him to consider running for political office against sitting city magistrate Quintus and an impoverished aristocratic marriage for his daughter Temple; the cultivated Greek Glaucus; the gladiator Lydon; the noble-born Antonius and his sister Ione, the evil Isis-priest Arbaces who is after (their) money and power; the persecution-fearing Christian slaves Petrus, his true love Chloe and their secret leader Olinthus. 1) It's originally a three part mini-series. It would probably have been better if it was presented as such here, but it was presented as one 4 1/2 hour film (albeit split on two discs). It would probably have been easier to digest in smaller chunks. 2) Mixing great actors with mediocre ones is a risky business. It takes a really good director to pull it off successfully. Peter Hunt isn't good enough. 3) The whole things seems to be a whole bunch of subplots in search of a story. For me it basically became a four hour waiting period until the volcano erupts. 4) The gladiator sequences may have been exciting three decades ago, but has been done so much better since. On the plus side, Ernest Borgnine was great, as ever. Franco Nero too. It was fun to see Fulci favorite Catriona MacCall in a non-horror role. 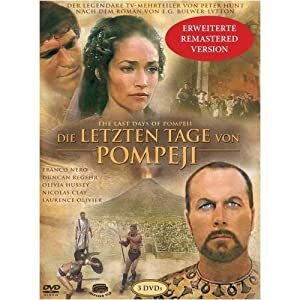 The destruction of Pompeii was quite well done for a TV production, even though the sequence wasn't all that thrilling. To sum it up - not all bad, but way too long. Three stars is generous. Windage and elevation Mrs. Langdon. 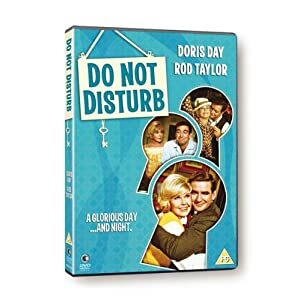 Overview Screen legend Doris Day stars opposite Rod Taylor in this fun-packed romantic romp. American couple Mike and Janet Harper must relocate to London for Mike's job as a wool executive. Arriving in Blighty the happily married pair soon start to encounter marital problems. When Mike starts at the new office he has his head turned by a new secretary and Janet, who is not getting the attention she feels she deserves, is taken in by the charms of an amorous antiques dealer, leading to jealousy issues with hilarious consequences. My thoughts I have to confess: I love Doris Day! I have bought pretty much every DVD with her that I have been able to find. That said, this is not her best film. She and Rod Taylor don't have the same chemistry as she and Rock Hudson. The studio backlot may be ok as a French street, but it's rather unconvincing as the English countryside. The story is pretty contrived in parts, but I guess many comedies are. Still, the film has its moments. There's a bit of an in-joke when on of the French kids learns that she is American and asks her if she knows Rock Hudson. And the title tune is pretty catchy, song by... guess who. Britt Ekland is supposed to have an uncredited appearance, but I didn't spot her. I'd give Doris a four, but for the film a weak three is generous, so all in all it's 3 1/2 at best.